The famous one and only work Mozart composed for harp, which made Emmanuel fall in the love with the instrument when he was 6 years old. Here beautifully conducted and played by the flutist Philippe Bernold. Emmanuel joins Raphaël Pichon and his Ensemble Pygmalion for a romantic evocation of the Rhine and its maidens, through the German composers Wagner, Brahms, Schumann and Schubert. Enjoy the virtuosity and luscious musicality in these French early 20th century concertos by Saint-Saens, Pierné, Dubois and Renié. Emmanuel is accompanied by the Orchestre Régional Avignon Provence, conducted by Samuel Jean. A crossover mix of famous French chamber music works by Debussy, Jolivet, Cras, and exclusive arrangements of chansons sung by Alexandra Cravero. This "Classica" CD chamber music collection is led by flutist Anette Maiburg. In this complete collection of Debussy's orchestral works by the Orchestre National de Lyon, conducted by Jun Märkl, Emmanuel gives a beautiful rendition of the famous Danses sacrée et profane. A live ARD Prizewinners concert, accompanied by the legendary Bavarian Radio Orchestra. Emmanuel's talent shines through the Glière Harp concerto, conducted by Lawrence Renes. During his 9 years with the Paris Opera, Emmanuel and Principal Flute Frederic Chatoux developed a beautiful complicity in the pit, but also on stage! Recorded live, this CD-DVD box is a vibrant memory of their friendship. 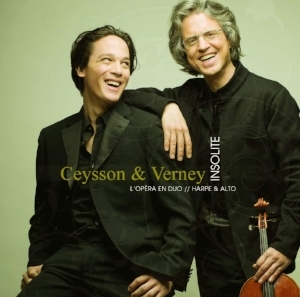 A tribute to opera, with exclusive arrangements of famous arias from Tchaikovsky, Bizet, Purcell and others, played by Emmanuel and Laurent Verney, Principal Viola of the Opéra National de Paris. Emmanuel's first concerto CDs, with Rheinland-Pfalz State Philharmony conducted by Hannu Lintu, including the rare Zabel Concerto and Parish-Alvars Concerto for 2 Harps with Xavier de Maistre. 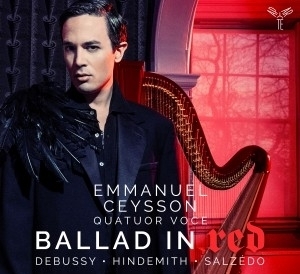 The debut recording of Emmanuel, just after winning the 2004 USA International Harp Competition! It includes most of the standard French solo harp repertoire.